Home News NUJ Lagos Has A New Chairman. 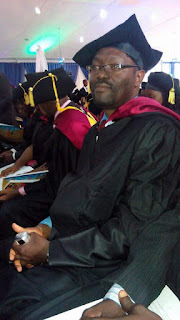 He Is, Dr.Qasim Olalere Akinreti. NUJ Lagos Has A New Chairman. He Is, Dr.Qasim Olalere Akinreti. The Nigerian Union of Journalists now has a new Chairman for the Lagos Chapter of the association in the person of Dr. Qasim Olalere Akinreti of the Voice of Nigeria, VON who emerged the new Chairman of the Nigeria Union of Journalists, NUJ, on Friday in Lagos State. Akinreti defeated Mr Leye Ajayi of the News Agency of Nigeria by 288 to 272 votes to emerge winner of the NUJ election held at the Multi-Purpose Hall of the Eko FM, Agidingbi, IKeja, Lagos, Southwest Nigeria. Abiola Beckley of Daar Communications also won by 282 votes defeating Innocent Anaba of the Vanguard who polled 275 votes to emerge as the Vice Chairman of the Council. The new Chairman is with the Voice of Nigeria as Assistant Director, News and Head, Reportorial Corps.